Enter details below to get your discounted price! 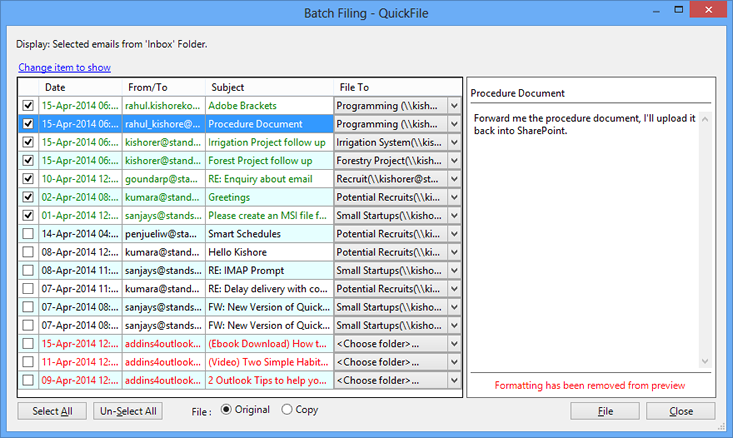 The old version of QuickFile previously recommended folders based on email addresses only. We have completely rewritten the recommendation engine to take into account many other variables. As a result you will find that QuickFile is much more accurate at predicting the correct folder for an email. The technology used for filing emails in the older versions was 5 years old. We have replaced this with the latest tools from Microsoft. We have also optimised all the code to ensure that you don’t have to wait for QuickFile anymore. We have combined several screens from the old QuickFile into one significantly easier to use screen. One of the biggest changes in the last 5 years has been the introduction of Smart Phones. We now process emails from multiple devices. We’ve also improved QuickFile so that it knows which emails have been filed already so that they won’t show up on the Batch screen a second time. While there was a defer/snooze feature in the old version of QuickFile, this had limited functionality. Last year we introduced eeminders as a separate product and this proved to be a runaway hit with our customers. We’ve now included eeminder functionality into QuickFile. This means that you have more options when you defer emails… and they can actually come back to the TOP of your Inbox. You could already create Send & File, Send & Task and Send & Calendar from the old version of QuickFile. This functionality creates a Task or Appointment automatically from emails after they are sent. QuickFile now also has Send & eemind. 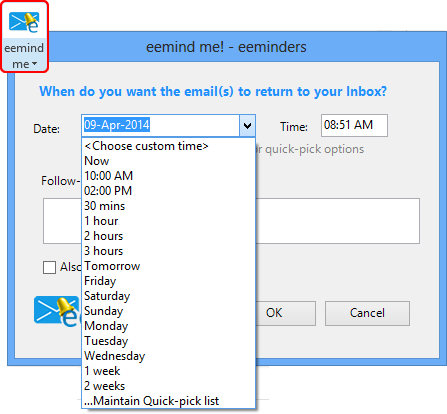 You can set a reminder date and time on an email when you are sending it. A copy of the email will automatically be returned to your Inbox on your chosen date and time to remind you to follow up. QuickFile Ultimate Edition (previously called QuickFile Lawyers Edition) can export your emails out of Outlook so that you can archive it with the other files on your computer. QuickFile Ultimate Edition can print all your sent and received emails for the day (except the emails you mark as private) at the click of a button. If you maintain printed paper records, this will ensure that no emails are missed. Many users are now moving their email accounts to Office 365 and other Microsoft Exchange providers because it allows much better synching of data between Smart Phones (including IPhones), Tablets and Computers. QuickFile 5 is 100% compatible with all features of Office 365 including normal email accounts as well as Site Mailboxes. 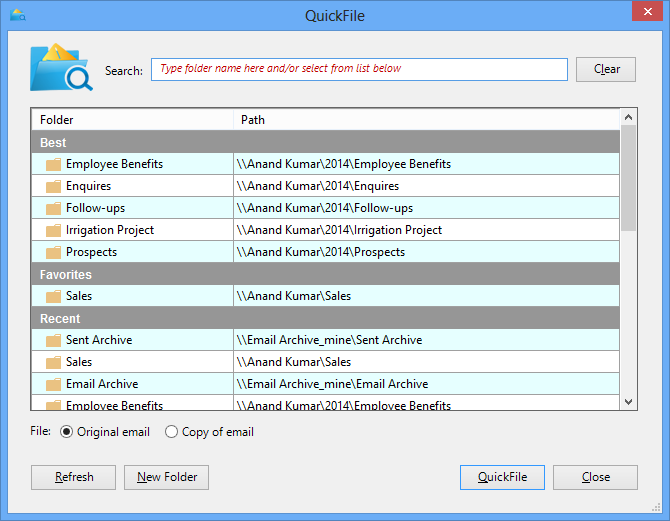 You can see a full list of features in QuickFile 5 here. This way, you can try QuickFile without risking a cent of your money. As a Microsoft Partner, we have been helping thousands of Outlook users all over the world for more than 12 years. We are a located in the tropical islands of Fiji and specialize in development for and with Microsoft® Outlook® and the rest of Microsoft Office (Microsoft® Access® /Microsoft® Word ®/Microsoft® Excel®).